This article first appeared in Personal Wealth, The Edge Malaysia Weekly, on January 14, 2019 - January 20, 2019. 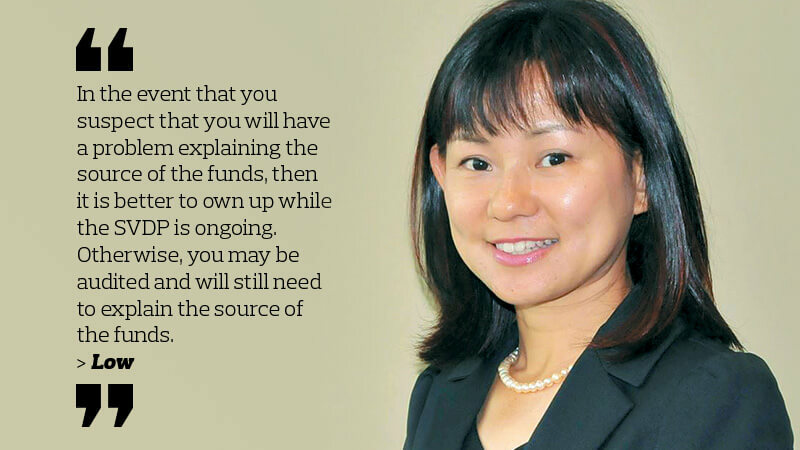 Malaysians with assets and income kept in tax-free or low-tax jurisdictions could avoid being slapped with steep penalties in the future by responding to the Inland Revenue Board’s (IRB) special voluntary disclosure programme (SVDP), says Stefanie Low Geok Ping, executive director of business tax, tax audit and investigation at Deloitte Tax Services Sdn Bhd. She explains that prior to the ratification and implementation of the Standard for Automatic Exchange of Financial Account Information in Tax Matters in 2017, there was no compulsion for taxpayers to reveal assets outside Malaysia as the country practises a territorial tax system. But now, signatories of this agreement have the ability to harness financial information for auditing purposes. So, taxpayers with cross-border accounts have to be prepared to answer for their financial transactions. “Take the British Virgin Islands, which is a tax-free jurisdiction. If you park your [business] profits there, you do not pay any taxes. However, if those profits originated from business activities in Malaysia, then the income should be considered sourced in Malaysia and subject to Malaysian tax laws. Just because you have it paid to a British Virgin Islands bank account does not mean that tax does not have to be paid in Malaysia,” says Low. “To avoid being taxed, some people may have two sets of accounts, where one captures some of the income in Malaysia while the rest is pushed to an offshore entity. So, you pay tax on the Malaysian portion, but not the overseas portion. That is considered tax evasion. The automatic exchange of financial account information was set up by the Organisation for Economic Cooperation and Development (OECD) to boost global transparency and deter tax evasion tactics. Malaysia is one of 109 countries — including global offshore financial centres such as the British Virgin Islands, Liechtenstein and Luxembourg — that have agreed to implement this regulation. The standard has two components — the Model Competent Authority Agreement, which contains the detailed rules on the exchange of information, and the Common Reporting Standard (CRS), which contains the rules for reporting and due diligence. Financial institutions are required to hand over financial details under the CRS. The agreement, which is on a reciprocal basis, allows for the automatic exchange of information (AEOI) related to financial accounts held by financial institutions — such as depository institutions, custodial institutions, investment entities and specified insurance companies — with other jurisdictions annually. 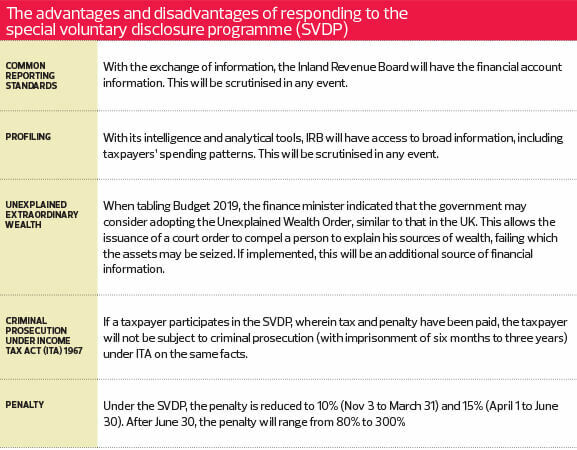 In tandem with the exchange of information exercise, which began in June 2017, the IRB announced the SVDP in November last year to give taxpayers the opportunity to report and pay tax on undeclared income derived in Malaysia. Low points out that the main advantage of the programme is that any taxpayer who makes a voluntary disclosure from Nov 3, 2018, to June 30, 2019, will be accorded a reduced penalty rate of 10% or 15%. Separately, the IRB has assured that information received during the exercise will be kept confidential in accordance with Section 138(2) of the Income Tax Act 1967, which states that no classified material shall be produced or used in court or otherwise, except for the purposes of the Act or another tax law. “Moreover, the IRB has publicly announced that it will accept the voluntary disclosures in good faith. In other words, no further review will be made on the information disclosed by the taxpayer, provided that the disclosure is in sync with the information obtained via the AEOI network,” says Low. “Let’s say you have been reporting your income for the past five years and your income is only RM10,000 a year, but you have S$10 million in your Singaporean bank account. This clearly does not make sense. So, you have to be able explain where the excess comes from. Under normal circumstances, when a tax audit is conducted and discrepancies are found, the ramifications include a penalty of up to 100% of the shortfall in tax (in cases where the returns are incorrect) or 300% of the shortfall in tax (in cases where the taxpayer fails to file tax returns). For cases in the latter category, there may be imprisonment upon conviction. “But under the SVDP, the penalty has been reduced to 10% (Nov 3 to March 31) and 15% (April 1 to June 30). After that, the minimum penalty will be 80%. The maximum allowed by the legislation is 100% for incorrect filing of tax returns or 300% if you do not file your tax returns. And do not forget, the IRB could pursue criminal prosecution if it suspects tax evasion,” says Low. The golden rule when it comes to keeping records of tax returns is seven years. According to the IRB, you can be audited for up to five years of assessment and there is no time limit on the audit if there is fraud or tax evasion. It is worth noting that capital gains are not taxed in Malaysia, except for gains derived from the disposal of real property or the sale of shares in a real property company. “Every year, you will have an opening and closing balance. So, you must be able to explain what is in between. You will have to do an honest declaration because if you expect the IRB to accept in good faith, you will also need to come forward in good faith. Good faith works both ways,” says Low. One of the biggest problems she foresees is poor record keeping. “Most individuals and businesses are not very good at keeping records. Those that have taken the position that the source of their funds is not subject to tax in Malaysia may not even keep any records. Hence, they need to consider how they should approach the SVDP,” she says. “Let’s say you have an account in the British Virgin Islands, the source of income may be from dividends sourced outside Malaysia. You just need to make sure that all your records are in order and that you have no problem explaining the source of the funds. In a Nov 13 statement, the IRB said notices had been sent to 79,786 individuals, companies, organisations, cooperatives and other entities with property and extraordinary wealth that have yet to pay tax. According to IRB CEO Datuk Seri Sabin Samitah, these taxpayers will be sent an offer to voluntarily confess as well as a notice under Section 79 of the Income Tax Act 1967 to provide more information or clarification. They have 30 days to respond to the notice. If they do not, they can be fined a maximum of RM20,000, jailed up to six months, or both. Low says the IRB has assured that the voluntary disclosure process is simple and straightforward as one is required to write in a letter or submit an email with the necessary details.